Wendy is a fellow female motorcyclist who currently rides a 2009 BMW R1200GS and is pretty much always out on the road exploring. In fact, she is only at her home in Nevada about once a year. You could say that the road is Wendy's home, as she considers the freedom of motorcycling to be her meditation. During her past ten years of riding, Wendy has owned a 2003 Honda Shadow 650cc, 2006 750cc Honda Shadow and a Yamaha Warrior 1700cc. Her latest travels are taking her from New Mexico to Santiago, Chile… and get this… she was thinking of doing it alone! Talk about an independent and smart motorcycle woman! Wendy and her friend Kari Castle have setup a website titled "Live to Fly to Ride Presents Women, Wheels, and Wings". You can follow her and check out ongoing photos of the trip here. As you can tell from the website, Wendy loves traveling on her BMW. She states that she loves the freedom of two wheels and hates being out of control on the back. Riding to her is a spatial freedom that you cannot achieve in a car, you can go off road, on road, between cars, and motorcycling has a small footprint. Wendy has fortunately never been in a motorcycle accident, and is a true believer in the necessity of proper gear. 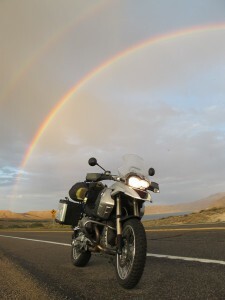 She wears BMW riding gear and also padded clothing from Boulder which is a high quality product for outdoor activities. After taking the MSF (Motorcycle Safety Course) twice, she definitely knows her skills and believes it should be a requirement for all riders. After all, riding is meditation… except of course, not in the city… then it is just a game of keep away. Wendy belongs to the Women's coalition of motorcyclists and Women on Wheels. She does not enjoy riding in groups, as she prefers the solitude and freedom of her own path. 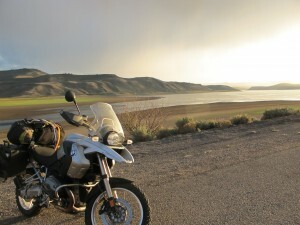 As part of her cross country traveling, Wendy plans on purchasing a KLR because it will do the task she needs, can be bought cheap, and she can leave it in a foreign country if need be. According to her, "Riding makes me feel like I'm much stronger than I really am. I feel like a superhero." I couldn't agree more.